All Purpose Adjustable Angle Head Lamp! Made of corrosion resistant, unbreakable ABS Polymer. Beam adjusts cleanly from spot to flood with no shadows. 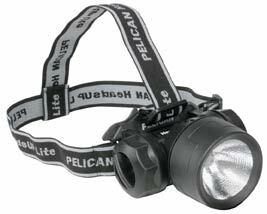 Pelican's new powerful lightweight HeadsUp Lite was designed to provide hands free light to the exact area desired. The expandable strap allows you to securely attach the HeadsUp Lite to helmets, hard hats, caps and offers a comfortable fit to the barehead. The HeadsUp Lite rotates up and down and with the special ratcheted locking system, the head of the light stays where you put it. The large Pelican computerized reflector and Hi-intensity Krypton lamp produce a bench mark lighting system. 4 AA Energizer batteries and spare lamp included. With elastic expandable cloth strap. Perfect for barehead or hat use. With hypo-allergenic, heat resistant silicone rubber strap. Ideal for hard hats , helmets. 4-5 hours (backup) 3 13/16" 0.943 lbs.